Dillon came to our home today. Larry and Terrina brought him to us to minimize trauma and escaping. He came to be at TLC Chows from the Georgia Chows- some of you will recall the story of the ick-pray who released 26 Chows from his puppy mill operation onto a busy highway, where 4 lost their lives. 136 total Chows were taken from this so-called man. 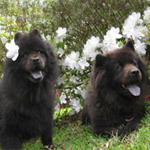 Dillon is one of these Chows. The man got sentenced to 4 years in prison. Should have been more, but just thinking about his bunkmate Bubba plowing his own highway makes me smile a little...yes, I am a bit vindictive. Power to the disenfranchised! Anyway, Dillon is very uncertain- as Larry says, scared of everything. Montana and he are fine together, and Lily is her usual Queen self. Dillon went upstairs with Haley, and found our tiny half bathroom to his liking. That is where he is in the photos. Lily and he had their first look at each other there, with me in the middle handing out treats. The next meet and greet was outside with both on leads. Lily did react a couple times, but also got very close without incident. I think it will be fine. At first, Dillon would not take a treat from me. At the upstairs greeting, he watched Lily eat them with relish, and the sound of her enjoying them was too much. He took several treats and cheek scritches. Just like our Lily, there is no touchy of the paws, please! It took him some time, but he is now going up and down the stairs and exploring the entire house. Without further ado, I give you our newest roomie, Dillon. BTW, Lily's new 'little brother' weighs a svelt 75 pounds! He's beautiful Audrey!! Good luck to you, and bless you for giving him a loving home. I look forward to hearing more about him and seeing more pics!!! 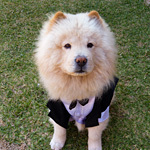 Awww look at his face, I have to confess to having a weak spot for cream chows . He is very good looking. At 75 pounds, he is the size of my Malachi. Dillon is gorgeous! Wishing you all luck! Very nice, both the story and Dillon. He looks great. So good to hear he is in a good place. I remember that story, and it was heartbreaking. 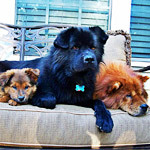 I had the pleasure of meeting some of the chows from that Georgia debacle, as well as being a friend of one of the people trying so hard to save them, and it's just so very sad. But, hopefully, more and more of them will find their way into someone's life and love. I'm glad Dillon seems to be settling in so well, he looks as if he feels better already!!!!!! We had a fun first full day. 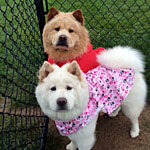 It was a beautiful day here, high 50's- perfect Chow weather. He seemed to enjoy watching me clean leaves and debris from my flower beds in their yard. He is skittish like a colt. He has been getting longer spells of relaxation and his tail is going up more often. Unlike my girls, he will not walk ahead of me, but follows close behind. He is on constant guard that I'm going to 'pull something', so I mostly ignore him, and talk to him over my shoulder. Going in and outside is comical- 3 doors to walk through seems 2 too many for Dillon. I make mine wait at door one, then wave them through...he waits as well, but does not trust me to walk past me very often, so I go out after Lily and Tana, and he follows. I am 3rd in line going back in, too. It's sounds like Lily is going to be the one who helps Dillon come out of his shell and be comfortable in situations. She may also help bridge the gap between the two of you. Keep us updated! I love hearing tales like this. Progress is so good, and every little thing adds up that in the end when he's a changed dog we can look back at the little landmarks and smile. Every day is a new adventure...and every night too. The first night, Dillon slept upstairs in Haley's room. Lily slept near my bedroom doorway (usually she plops on the bed by the staircase) and Montana slept on her usual spot right next to my bed, on her own bedding. Last night, big boy decided to change it up by sleeping on the runner rug outside my door. He bravely kept sticking his head in my room to see if there was maybe somewhere in that little room for him as well. I guess that was Lily's last straw. As soon as he left my room, she beelined it in. She plopped on the floor at the foot of my bed, which is only a couple feet from the doorway. Every time he stuck his head in she would give a little growl. What did Albert Einstein say is the definition of insanity? Doing the same thing over and over again and expecting different results. It was insanity. Finally, the constant mom guarding and hard floor wore Lily down. Her solution? Try and oust Montana from her bed! Montana was having none of it. The next thing I knew, Lily was trying to pull some of Montana's bedding over so she could lay there too. Try as she might, she could not get enough of it to feel confortable. All the while, Dillon was pacing outside the door, sticking his head in to see the status of things. At this point, I got up and got another thick blanket we use for dog bedding and put it next to Montana's. But no...Lily decided to go and lay back on the floor, but this time, it was on the side of the bed instead of the end. It must have been a good solution for all, because everyone settled and slept at this point. Me too. I woke with Montana sleeping on my right, Lily to my left, and Dillon on the rug just outside my door. At least I have the rest of today to situated things better should there be a reoccurance! Dillon is beautiful! He is Teddy's size, a big boy! And I remember Lily as a tiny girl. I am out of touch and don't know Montana at all. Are you fostering, fostering to adopt, or adopting? Maybe it doesn't even matter; Teddy was my first attempt to foster and he is here for life. Anyway, beautiful boy! Give him some pets from Auntie Jerilyn. Auddy, Dillon is stunning. I think Tychowgirl is right, Lily is going to be his tutor. Hi Jerilyn! It has been a long time, indeed. Montana (Tanny or Tana is what I call her) is Haley's girl she adopted from the shelter where she volunteers. Dillon is being fostered here until he gets a very special forever home. I would not be opposed to possibly adopting him when my own situation stablizes. My husband died December 4th and I am on disability from work for dual torn miniscus (minisci?) of my left knee and come to find out, I also have osteoarthritis. It's been a very slow recovery. I'm nearly healed, but need a job that pays better and does not have me working for a psychobitch. It is horrible to even contemplate, but Montana will probably not be with us alot longer. She is 15, and not all her years were...gentle. After she goes, I will add another foster. I think 2 that are mine and 1 foster would be a good mix. As to foster attachment- I had a little practice when my late husband bought a Pug puppy last spring. She was a funny little thing, but not my cuppa joe. I regarded her as such and it turned out great. She is at Brian's ex-wife's and I can see her whenever I wish. I think the trick is seeing them go to a truly loving home, and knowing there will always be another that also needs my help. what a beautiful dog!! You are doing an amazing thing for him. Thank you. and i share your sentiments - i hope his bum-chum and him are very happy in prison together! Auddy, he's adorable and so big too. I hate that he has to learn all the ways of being a pet so late in life, but they can learn and you and Lilly will teach him well. 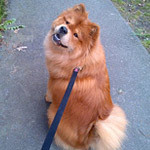 Isn't funny how the little girl chows have absolutely no fear of the big boys and the big boys just put up with them. Aww he is such a looker! Good luck with him. Love him! He's your "Zhu", Auddymay! Same coloring and same weight. Lily is going to insist he stay. She's putting a lot of effort in giving him some self confidence to be free of the burdens of his past life. Lily told Miss PB that she was a noncertified chowtherapist, btw. You can foster the third one that comes along! I'm also sure that Lily just loves having another chow to talk to and relate with. Even though she has Montana to hang out with and had Connie to throw around for a while, nothing beats having another chow in her life that she can have one on one talks with like she had with Pippy. Again, consider the third one as a foster. If you don't want to p'off the queenie there, Dillion is her's! Dillon really is her big boy. Watching them play on thursday at dusk was the best. Lily bowed and enticed like I have not seen since Pip died. After that night she guarded me in my room, things have taken a decidedly positive turn. The biggest hurdle will be his trust in humans.